Cape Town - It is an amazing thought that the Gabba in Brisbane, venue for the first Test against Australia from Friday, is virgin territory at that level even for Proteas veterans like the 155-cap Jacques Kallis and 102-cap Graeme Smith. But of course there is a pretty clear-cut explanation: the last time South Africa played a Test match there was as far back as early December 1963, when a fairly tame draw was the outcome and Kallis, now 37, was still some 12 years from his birth. Nobody connected in any meaningful way with the Proteas touring party today can claim any link to the 1963/64 occasion - the rival captains for that first Test were Richie Benaud and Trevor Goddard - although, for the record, Bill Lawry, who will probably be in the Channel 9 commentary box from Friday, opened the batting for the Aussies then and scored 43 and 87 not out. Both Kallis and Smith, the senior statesmen of the current touring squad, have a reasonable amount of prior top-flight playing experience of the venue because of one-day internationals, although it may come as little comfort that in four ODI innings against Australia between them there, neither stalwart has yet gone to the half-century mark on the scoreboard. Clearly in introducing the Gabba to a South African Test schedule for the first time in the post-isolation era, the Australians hope that the combination of a potentially seamer-friendly surface and their own strikingly impressive heritage at the ground, will assist in getting their noses in front in the three-Test series. It has been all of 24 years since the Baggy Greens last tasted defeat in a Test at the Queensland venue, back when the West Indies were still the premier force on the world stage and the November 1988 clash went their way by a consummate margin of nine wickets. The Aussies were in a bit of a transitional mode then, more or less as they are now, and South Africa’s acclaimed quartet of fast men - Dale Steyn, Vernon Philander, Morné Morkel and all-rounder Kallis - may be interested to know that the Caribbean side were too hot primarily because of a throat-ball quartet featuring Malcolm Marshall, Patrick Patterson, Courtney Walsh and Curtly Ambrose. Otherwise, though, the Gabba tends to be a notably productive hunting ground for Australia, as evidenced by their emerging victorious in all but one of the last eight Tests there. The only exception was the first Test of the 2010/11 Ashes series, when the pitch seemed to only get better for batting as the Test progressed, rather than the more customary other way around. In a high-scoring draw, the Aussie first innings was rescued from a wobbly 143 for five by a sixth-wicket partnership of 307 between Mike Hussey (195) and the now-deposed wicketkeeper Brad Haddin (136). But England’s second knock of 517 for one declared was the major talking point of the match, Alastair Cook (235 not out), Jonathan Trott (135 not out) and captain Andrew Strauss (110) pounding the home attack into submission and really banging in an irreversible peg for the remainder of the series. Two from its then-impotent ranks, Ben Hilfenhaus and Peter Siddle, are expected to feature again in Friday’s Test. There has been one further Test at the Gabba since that Ashes encounter, with the Aussies drubbing their trans-Tasman rivals New Zealand by nine wickets last season. Michael Clarke smacked 139 in the Australian first innings then, and the captain shapes up as potentially the main danger-man at the crease once more, especially with intended No 3 Shane Watson an unwanted injury casualty earlier this week. On that score, the absence of Watson robs the Aussies of their intended fourth seamer, and his replacement, the intended debutant Rob Quiney, is very much a batsman only. It may mean that the hosts are tempted now to sacrifice off-spinner Nathan Lyon and field an all-pace battery comprising Siddle, Hilfenhaus, James Pattinson and promising left-armer Mitchell Starc, with occasional left-arm spin back-up from Clarke if required. A snag to that scenario is that Lyon took seven wickets in that thumping of the Black Caps at the Gabba, including four in the first knock, and the ground is also known to assist the spin trade – the incomparable Shane Warne traditionally did well there. The Proteas XI ought not to require much in the way of rocket science to predict: unless there is a late setback of some kind, it will be exactly the same outfit which saw service in all three Tests in England, where the South Africans earned an acclaimed 2-0 outcome in their favour to seize the No 1 ranking. 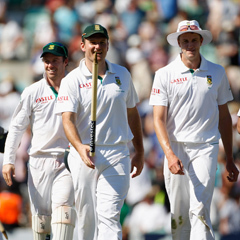 *The first Test starts at 02:00 (SA time) on Friday, with live television coverage on SS2, CSN and SH2.